Follow the signs! Check-in in the courtyard: receive a meal card, final Preseason information, and a detailed schedule. Check-in is the time to ask any questions of the Band Council members and Section Leaders. You then go to Charter Oak Community Center to pick up your keys and check into your room. Please check in at the Music Building first. Try to be as early as possible so you do not have to rush later on in the afternoon. Members with meal plans are encouraged to donate flex passes/meal swipes to help cover costs of meals throughout the season. Other UCMB apparel will be available for order. Other instruments are available in very limited quantities. If you need one, you must make arrangements with Emily Collins (ucmb.office@gmail.com) before you arrive for preseason. In almost all cases, you will be moving into the room that the Department of Residential Life has assigned you to for the fall semester. You should bring up everything you will need. Some band members choose to go home and get the rest of the things they need for their room during Labor Day weekend. Meals during Preseason are provided for all members of the Marching Band until meal plans begin on Friday, August 25. Times and locations of meals vary from day to day. Band members attend meals together; it’s a great time for band members to get to know each other in an informal atmosphere. Meals are an important part of team-building. Uniforms will be issued during Preseason. Members are responsible for the condition of their uniform and are accountable for the uniform issued to them. You must have a garment bag to be issued a uniform. Social events are planned several nights after rehearsal and all band members should attend these events. “Spirit Days” are events that unite sections and groups within the band with a fun activity. 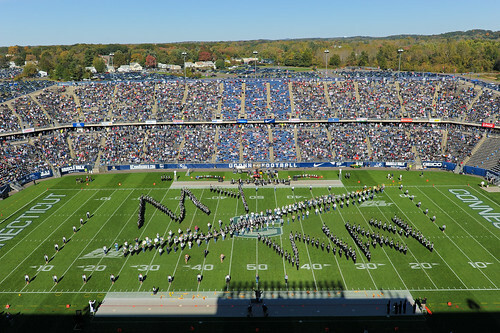 Freshmen band members are excused from all WOW (Week of Welcome) events. The 2018 UCMB Preseason Schedule can be found here. Share your pictures and memories by tagging them with #UCMBPreseason.